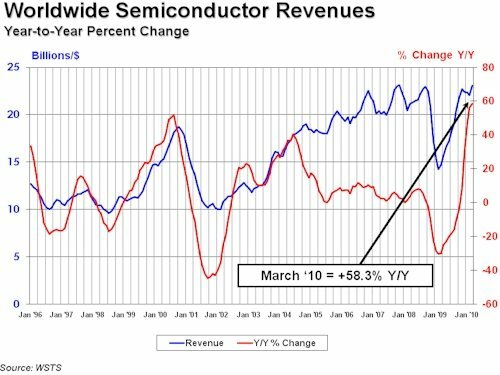 After a slight dip in February that was nothing compared to the precipice that chip sales plummeted over a year ago during the economic meltdown, global semiconductor sales did a sequential bump and are kissing the peak sales the industry hit in November 2007. The Semiconductor Industry Association, which tracks monthly chip sales across all types on a globally basis, said that in March, revenues rose by 58.3 per cent, to $23.1bn. That also represented a 4.6 per cent sequential bump from February, when sales were $22bn and actually down a bit from January. As you can see from the chart above, the economic meltdown just sucked the oxygen out of the global chip market, with a decline that was even steeper than that experienced during the dot-com bust. However, the computers and other electronics we use in our lives are much more pervasive and numerous, and more of the 6.5 billion people on the planet have them, than was the case a decade ago, so the absolute revenues that chips bring in each month is much larger and there is a new floor of sales that seems to be around $15bn compared to around $10bn a decade ago. The decline in global chip sales thanks to the economic meltdown was steeper than during the dot-com bust, and the recovery has been quicker and now effectively complete. (Note: the SIA's statistics are three-month moving averages, which tend to smooth out the curves a bit). In the first quarter, SIA says that chip sales of all types were up 58.4 per cent, to $69.2bn. "Global sales of semiconductors set a new high for the month of March and were second only to the record sales reported in November 2007," said George Scalise, president of the SIA, in a statement accompanying the numbers. "Healthy demand from major end markets coupled with restocking to normal inventory levels contributed to strong first-quarter growth. While we expect that 2010 sales will continue to be strong, the year-on-year growth rate will moderate going forward, reflecting the industry recovery that began in the second half of 2009." Scalise said that chip sales have rebounded as wafer bakers are ramping up production and stocking supplies to meet expected demand for the remainder of the year, and he added that the SIA is not predicting overcapacity or excess inventories as it looks ahead. Computing and communications devices account for 60 per cent of total chip demand and are "seeing healthy unit growth," according to Scalise, with PCs projected to grow at the mid-to-high teens and handsets expected to grow in the high single digits this year. "Continued growth for the semiconductor industry is closely tied to continuation of the global economic recovery," Scalise said. "We remain cautiously optimistic that global sales will show double-digit growth in 2010," Scalise concluded. Chip sales have just exploded in the Asia/Pacific region, where an ever-increasing portion of the world's electronics are manufactured and where the bulk of chips get sold. (And, increasingly, where chips are baked as well. The Middle kingdom should just build a 10 billion node cloud and just cut out the middle men). In March, Asia/Pacific accounted for $12.57bn in semi revenues, up 72 per cent year-on-year and up 3.8 per cent sequentially. The Americas region accounted for $3.82bn in sales, up 48.2 per cent compared to March 2009 and up 5.6 per cent from this February. Europe still makes stuff and therefore still buys chips, and in this case, manufacturers of various devices consumed $3.08bn in chips, up 42 per cent year-on-year and 7.1 per cent sequentially. Japan bought $3.59bn in chips, 43 per cent more than a year ago, and an increase of 4.6 per cent from February's levels. While overall semiconductor revenues were up smartly in the first quarter compared to a ridiculously easy compare, as far as market researcher IDC knows, PC microprocessor unit shipments fell a little less than usual sequentially from the four quarter, dropping 5.6 per cent when shipments usually fall 7 to 8 per cent sequentially. On a year-on-year basis, PC processor shipments were up 39 per cent and revenues were up 40.4 per cent compared to the first quarter of 2009. The IDC numbers put x64 server chips into the data, by the way, which is weird but necessary because x64 workstations use the same chips as servers. Compared to the fourth quarter of 2009, x64 server chip shipments were down only 1.4 per cent, compared to a 6.3 per cent shipment drop for mobile PCs and 5.1 per cent for desktop PCs. Average selling prices for PC (and server) chips rose by 4.1 per cent even as shipments slowed, which shows people are investing in performance. But some are going for cheap chips. For instance, Intel's Atom processors accounted for 20 percent of Intel's mobile PC shipments, but this was off from 24 per cent of the mix in the year-ago quarter. "Intel's new Core processors and AMD's new Athlon processors are ramping, and at a time when, IDC believes, consumers and corporations will be anticipating a much healthier 2010 and looking for more value than just low price in their PCs," said Shane Rau director of semiconductor personal computing research at IDC. "In terms of the processor, that means more openness to paying for benefits such as good performance and reduced power consumption that serves long battery life." Intel accounted for 81 per cent of unit shipments in the first quarter in the PC (and x64 server) space, gaining a half point of share, while AMD got 18.8 per cent of shipments, losing six-tenths of a point of share. VIA Technologies had a tiny two-tenths of a per cent of the PC (and x64 server) chip pie. Intel had 87.8 per cent of the chip shipments for mobile PCs (compared to 12.1 per cent for AMD and 0.1 per cent for VIA), while in the PC server/workstation segment, Intel had a 90.2 per cent share of shipments (compared to AMD's 9.8 per cent slice of the pie). AMD has the best share on the desktop, with 28 per cent of shipments compared to Intel's 71.7 per cent and VIA's three-tenths of a point.